Whether your building a custom home or condominium project, Lions has equipment, trucking and skilled labour required to get the job done. Looking to build a custom home, Lions has the experience you require while building in established neighborhoods. 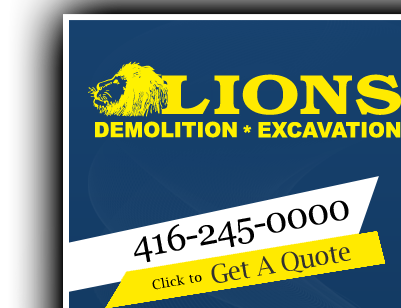 Combined with our demolition services, we provide an all in one package and the greatest value for your dollar. We are committed to our clients to maintain the highest level of quality while delivering cost efficient results and meeting the most demanding schedules. From deep excavations to residential subdivisions, Lions can meet your needs. 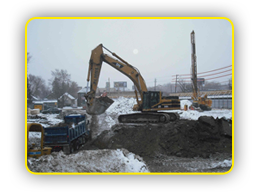 We operate our own fleet of Excavation Equipment including Excavators, Bulldozers, Loaders, Backhoes, Compactors and Skid Steers. We also have a fleet of Trucks to haul all material off site. 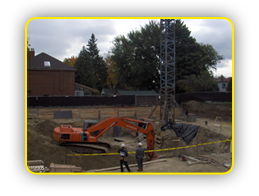 Lions has the experience to successfully complete excavations for any size of development project. 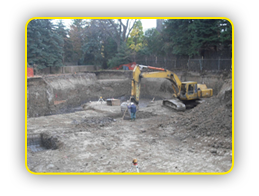 From deep excavations to parking lot preparation we have completed them all. Our fleet of earth moving equipment & trucks are capable of undertaking any excavation project.